The popularity of e-bikes has risen in the UK over the past few years as more and more people turn to electricity to help power their ride. With the introduction of a new technology and cycling discipline comes much confusion and perhaps even some animosity. Just like with any new development, there are early adopters who are raving about the benefits of using an e-bike but what about those who still aren't sure how an e-bike can help you get fitter? We're going to take a closer look at e-bikes, their benefits, and whether you can get fit riding one. 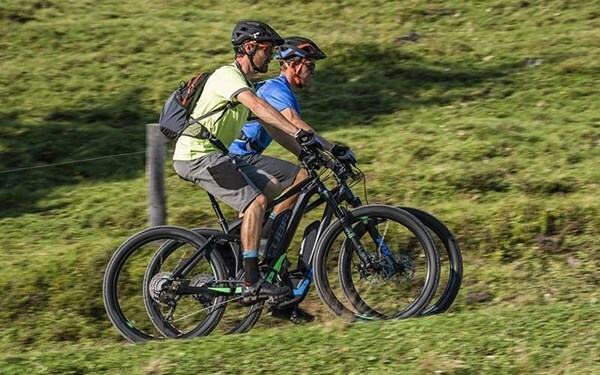 E-bikes are pedal-assisted bikes, this means the motor is only engaged when you turn the pedals (making it very different from a moped or other engine powered vehicle). E-bikes come with different sized batteries and motors meaning they vary from bike to bike on distance travelled and efficiency. Types of e-bikes: Within the category of e-bikes there are a variety of different bikes and each one has a specific purpose. E-MTB's - Designed for trail riding, up steep terrains and allowing you to discover brand new trails. hybrids - Built for riding both around town and on gravel paths. Ridden by commuters and for leisure. Folding - Smaller in choice for different brands but this is the ultimate commuter bike for those needing to use other modes of transport like a train or taxi. Road - Ridden by those wanting to travel further on the weekend or those who struggle to keep up with the club run. E-bikes work fairly similarly to normal bikes, with the exception of the battery and motor. E-bikes are limited to 15.5mph (25kmph) meaning they are safe to use on the road and on cycle paths, for most, this speed is more than enough to help transport them to work, the gym, and into town. E-bikes require charging every so often using a normal mains plug, it is estimated that it costs a mere 15p to fully charge a e-bike, depending on your type of riding, this could last at least a week. Definitely a decrease from filling up the car. Maintenance is reasonably the same with an e-bike; the gears, brakes and components are almost identical to their non-electric counterparts. Find out about maintenance here. "But it's just cheating?!" - Well yes, if you were entered into a non-e-bike race and trying to fool everyone into thinking you're the next Chris Froome. For most people who ride e-bikes, they aren't doing it to try and ride faster than everyone else for the sake of a KOM/QOM, most e-bike riders are just looking to ride more. Put most simply, an e-bike allows you to ride further, faster and for longer. Is there really any harm in more people out cycling? "Well it's just a moped, not a bicycle at all…" - As mentioned previously, this is not the case as a pedal-assisted e-bike requires you to pedal and the speed is limited. There are a variety of reasons why people are turning to cycling as their main mode of transport, so here are a selection of the main reasons people are getting out on two wheels. Increase inactivity levels - The UK Government recommends a minimum of 150 minutes a week of moderate to vigorous activity (5x 30 minutes if you don't fancy getting it all over with in one sitting! ), this can help to reduce the detrimental effects of a sedentary lifestyle, if you have a desk job this means you. But how does an e-bike come into this? It may seem like an obvious connection but an e-bike means more cycling and more physical activity. An e-bike removes all barriers to entry with cycling; don't feel fit enough, too many hills, takes too long to cycle. With an e-bike there really aren't many reasons not to cycle so you can easily achieve those 150 minutes just by cycling to work and perhaps into town. Save money on fuel - As mentioned earlier, the cost to charge an e-bike is roughly 15p for every full charge. When you compare this to the cost of an average tank of fuel, £45, most people will easily use one tank during a week either commuting, driving to pick up the kids, going to the shops, and many more. Imagine if you could almost half that usage by either cycling to work or taking the kids to school on their bikes. It is estimated that nearly half of all journeys in the UK by car are between 1-5 miles, something that would take next to no time on an e-bike. How much time you save by removing yourself from the ever-increasing car traffic to quiet country lanes? Quicker, easier, and inclusive - As mentioned previously, e-bikes reduce both time and effort cycling, but this doesn't mean you cant get your heart rate up and get in just as much exercise as on a mechanical bike. Due to the fact you are out riding for longer periods of time, you can get in just as much exercise as normal. More time outside - More and more, we are swapping time outdoors for sitting in front of the TV, the steering wheel and then the computer screen. Even just cycling to work will reduce your sedentary time and with a e-bike you will never end up getting to work in a sweat. How to get fit with an e-bike? So, we've covered what an e-bike is and how it can benefit your health, but how do you actually get fit with an e-bike? Increase your normal ride distance - We've mentioned many times that you can ride further with an e-bike, with the fear of being caught out too tired to ride home gone, you can discover more roads. Lets say you normally ride 15 miles, on an e-bike you'll probably be able to ride 20-30 miles. That's a huge increase and you'll be getting so much more time out on the bike. Don't forget, it's pedal assisted so although you'll have help from the bike, you still have to ride the distance. Where could you ride if you had one? Use less assistance - In the beginning you may rely on turbo mode for the hills and during a strong headwind but as you ride more and more, turn that motor in sport or eco mode to rely on your own legs. As you become fitter you'll only need to rely on the top assistance modes during particularly steep hills. Your fitness will increase and you'll be able to cycle further, perhaps even try cycling for short periods of time with the battery turned completely off. Cut out the car - Now you have an e-bike, riding to the shops or the gym will help to increase your weekly physical activity levels. If previously it was too far, that distance will now be manageable and you'll much prefer spending the time outdoors compared to behind a wheel. Kalkhoff's Jubilee Excite B7 has been designed with comfort, value and reliability in mind. With the Bosch motor you are able to travel further than ever before. Conquer the trail with the all-new Scott E-Genius 920, featuring a powerful Shimano motor and proven MTB technologies to take on the toughest of terrain. The Paralane2 is a agile, lightweight bike that gives you a helping hand when you need it most allowing you to explore places which are otherwise out of reach. We have 5 dedicated e-bike centres where you can come and view our incredible, diverse range of electric bikes. Our e-bike centres are at Whitwell, Grafham, Peterborough, Pitsford and Barnwell Road.